Volkswagen has launched the new Beetle this week with its premier coinciding in Shanghai, New York motor show in addition to a special event in Berlin, Germany. 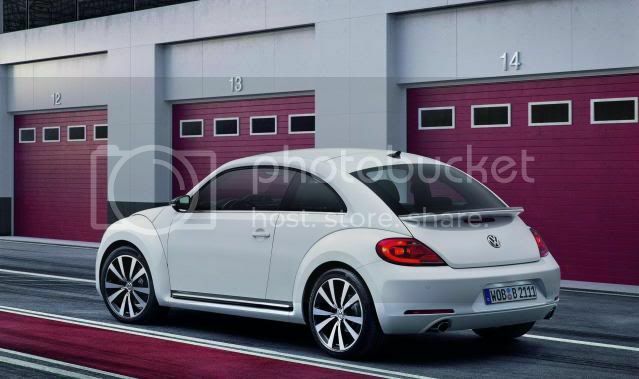 The new car builds upon the retro-chic of the ‘New Beetle’ that launched in 1998, which clocked up over 1m global sales. Unlike the current Golf, Touran, and Passat (which are essentially heavily facelifted models re-branded as 'all-new'), Volkswagen claims every panel and bolt in the 21st Century Beetle is new. The new car measures up at 1,808mm wide (84mm wider), 1,486mm tall (12mm lower) and 4,278mm long (152mm longer), meaning it's wider and longer than the Golf hatchback. In charge of designing the new vehicle were Walter de’Silva (VAG design chief) and Klaus Bischoff (head of Volkswagen design). By doing so, the new Beetle obtains a flatter roofline – reminiscent of the 2005 Ragster concept), and squarer bumpers and interior. Power will come from six engines; a turbocharged 105bhp (104PS/78kW) 1.2, 160bhp (158PS/119kW) 1.4, 200bhp (197PS/149kW) 2.0 TSI, and a 2.5 litre with either 168bhp or 197bhp (170PS/125kW or 200PS/147kW) completing the petrol front. The later will stay in the U.S and produces torque figures of 240Nm (177lb-ft). Diesel power will come from either a 1.6 TDI with 105bhp (104PS/78kW) or a 2.0 TDI with 140bhp (138PS/104kW). The former will return 65.7mpg (4.3l/100km) and emit 112g/km while the latter (not available in the UK) returns 51.4mpg (5.5l/100km) and expels 129g/km. Volkswagen's 7-speed dual-clutch DSG and 6 speed manual transmission will be offered. 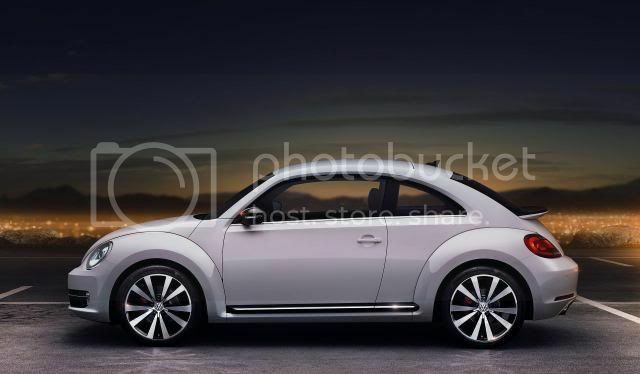 With three trim-levels available – Beetle, Design, and Sport – a wide range of optional extras like bi-xenon headlights w/LED daytime running lights, integrated rear spoiler, satellite navigation system, keyless entry, premium sound system, panoramic glass roof, and alloy wheels ranging upto 19” can be had. Inside, it's a typical Volkswagen with high-quality materials used throughout, however, the dashboard-mounted vase has been killed off. 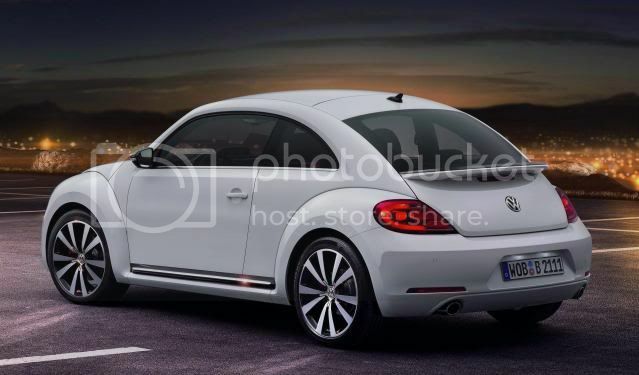 The Beetle will be produced in Puebla, Mexico with the larger Jetta. The new car will be available to order in the UK in the Summer, with first cars arriving in showrooms early in 2012. U.S and European sales will start this Autumn with more details will be available closer to launch. About 21.5m Beetles have been sold in the last 73 years. Volkswagen has unveiled the latest generation Beetle in Shanghai on the eve of the city's motor show, marking a new era in this iconic car's history. 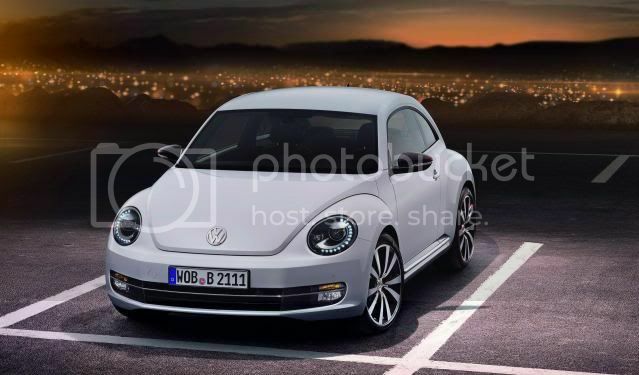 The latest generation moves away from design of the New Beetle of 1998 and instead draws on cues from the original and Beetle Ragster concept shown in Detroit in 2005. As such it's longer, wider and lower, giving a more masculine and dynamic appearance. The Beetle now measures 4,278 mm in length (+152 mm), 1,808 mm in width (+84 mm) and 1,486 in height (-12 mm). The track width front and rear, as well as the wheelbase at 2,537 mm, are also increased. Overseen by Walter de Silva (Volkswagen Group) and Klaus Bischoff (Volkswagen Brand), with Marc Lichte the team leader for exterior design, the car's new proportions mean the roof extends back further, the windscreen is shifted back and the rear section is now more akin to that of the original Beetle. The boot capacity is a practical 310 litres, up from 209 litres in the 1998 model. The Beetle has four seats, with a split-fold rear seat for added versatility. Inside the cabin, the Beetle's designers created a modern, practical and distinctive appearance with easy to identify and ergonomic controls. Certain features, such as the glovebox and colour accent panels hark back to the original. Three trim levels will be available - Beetle, Design and Sport - and each will be endowed with its own individual character and features. 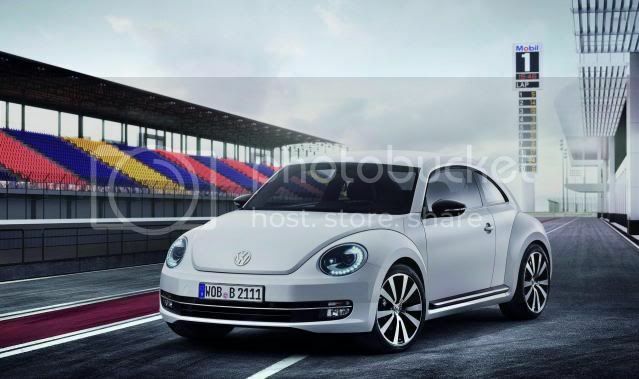 A wide range of innovative optional equipment will also be available, ranging from Keyless Access through satellite navigation systems and a panoramic sunroof to bi-xenon headlights and LED daytime running lights - all of which are available for the first time on a Beetle. In the UK, a choice of four engines will be offered: three petrol - a 1.2-litre TSI 105 PS, a 1.4-litre TSI 160 PS and a 2.0-litre TSI 200 PS; and one diesel - a 1.6-litre 105 PS with BlueMotion Technology. Thanks to the addition of Stop/Start and battery regeneration systems the Beetle 1.6-litre 105 PS is estimated to have a combined fuel consumption of 65.7 mpg and carbon dioxide emissions of 112g/km. As well as being economical and environmentally sound, the Beetle is also built to be one of the safest cars on the road thanks not only to features such as standard ESP and six airbags but also a laser-welded and galvanised body structure which has one of the highest torsional rigidity values in the segment at 26,000 Nm/?. In addition the range-topping engine, the 2.0-litre 200 PS, will feature standard XDS electronic differential lock as fitted to the Golf GTI. When the original was launched in 1938, it was known simply as ‘the Volkswagen', quickly acquiring a raft of nicknames from across the world. Whatever the name, its popularity is not in question, with 21.5 million sold in the past 73 years. A look back to the start: at the beginning Volkswagen built one of the most successful cars of all time and did not even give it a name. Why should it? After all, it was the Volkswagen! People loved it, and on all of the world's continents the small car was nicknamed according to precisely what it looked like: Beetle, Käfer, Vocho, Coccinelle, Fusca, Maggiolino or 甲壳虫! It embodied the automotive concept itself and symbolised the democratisation of mobility. 21.5 million cars were sold. Then the New Beetle arrived in 1998. It introduced a new automotive feeling to the world and brought with it Beetle Mania. In 2010, the Final Edition completed the New Beetle series that had sold more than one million cars. And now? A look forward. The future of the most famous car in the world begins now. In a completely new generation. It's The Beetle! And because Volkswagen and the Beetle call the globe their home, the new car is celebrating a transcontinental world debut - simultaneously in Shanghai, Berlin and New York . Volkswagen Beetle is an icon. This car tells a story. Only someone who knows its history could make a new generation of this Volkswagen a reality. The task ahead for the engineers was very clear. They had to develop a high-tech car that was still affordable, did not leave any stone unturned, integrated the communication technologies of our times and of course achieved the lowest environmental impact. It also had to be a car that places driving fun at the forefront. 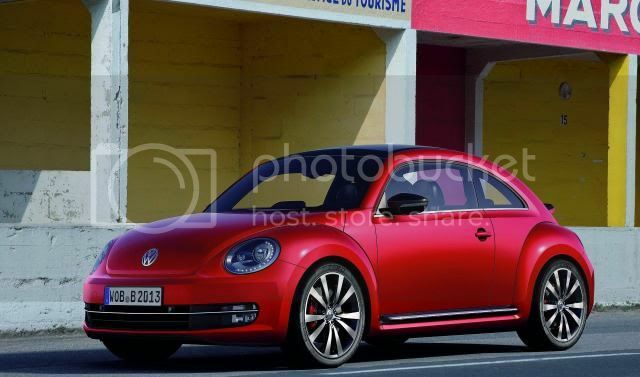 The new generation VW Beetle would have to be a very agile, dynamic performer, and the people who developed the Golf GTI would also be able to achieve this. No previous Beetle was this fuel efficient. High performance no longer suffices by itself: At 4.3 l/100 km (European 1.6 TDI) and 33 mpg (American 2.0 TDI), the new Volkswagen Beetle is the most fuel-efficient Beetle ever. The most recognisable automotive design in the world. Coke bottle, iPhone, Ray Ban Aviator, Beetle - how does one reinvent a design that is so recognisable and independent? There is a clear answer to this: It is necessary to understand the product and the brand; then it works! Volkswagen Design Chief Walter de Silva (Group) and Klaus Bischoff (Volkswagen Brand) "understand" both and therefore they set this as the objective for the Beetle: "Design a new original!" Challenge as a thrill. The team began its task under Bischoff's guidance. The challenge of designing a new Volkswagen Beetle was inspiring. 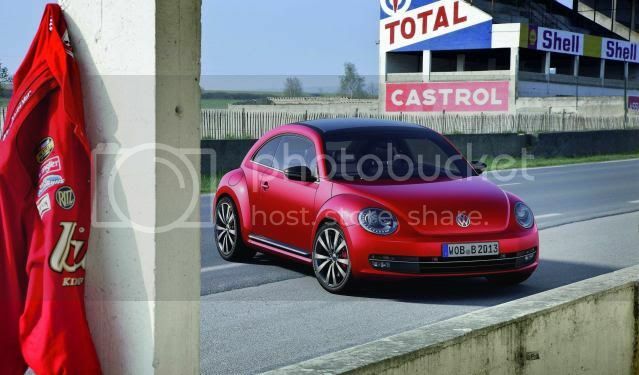 The designers knew that they wanted to develop the original Beetle profile more than on the 1998 New Beetle. They also made very dynamic proportions a high priority. An interesting aspect was that more than a few team members actually own their own air-cooled Beetles. It has also become a cult car among younger designers at Volkswagen. And that is how the final design of the 2011 Beetle came to be in Wolfsburg - a car of today as well as a design tribute to the automotive seed of an entire corporate group. And unmistakable indeed: If one were to take the first Beetle and the new Beetle and place them in a room together - shining light just over the roofs and viewing them from the side - one would see that the lines of the rear sections are nearly identical. Bolder, more dynamic, more masculine. A comparison to the 1998 New Beetle shows this: nothing remained as it was on the old car: "The Beetle is now characterised by a clean, self-confident and dominant sportiness. The car not only has a lower profile; it is also substantially wider, the front bonnet is longer, the front windscreen is shifted further back and has a much steeper incline. All of this creates a new dynamism," explains Klaus Bischoff. While the New Beetle was defined by three semi-circles (front wing, rear wing, domed roof above it), the new model has broken free of this geometry. The roof profile actually runs distinctly lower and can be considered a continuation of the Ragster concept car shown in Detroit in 2005 - a type of hot rod based on the New Beetle. 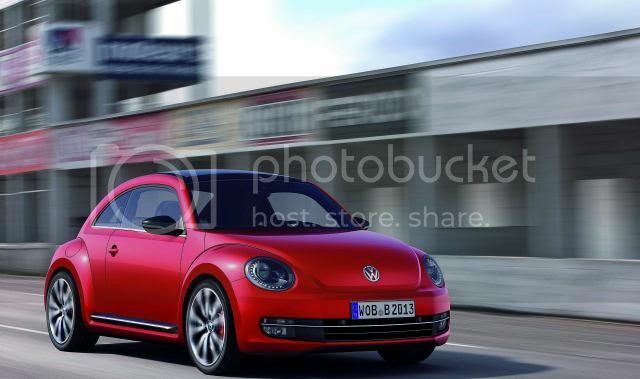 The new Beetle is bolder, more dynamic, more masculine. The figures confirm this: The new car is 1,808 mm wide (84 mm wider), 1,486 mm tall (12 mm lower) and 4,278 mm long (152 mm longer). This has resulted in entirely new proportions. The gain in length meant that the roof could be extended further, the front windscreen could be shifted back, and the rear section could follow the contour of the original Beetle. The new focal point is the C-pillar. In parallel, the development team increased the car's track widths and wheelbase. All of this gives the VW Beetle a powerful appearance with muscular tension. 2011 styling. Despite all of its individuality, the styling follows the Volkswagen design DNA created by Walter de Silva and Klaus Bischoff. It clearly expresses itself in the horizontal image of the front bumper, front air inlet, straight lines of the bonnet edges, the precisely drawn line between the A-pillar and C-pillar and the styling of the rear lights. Beetle, Microbus, original Golf. And yet it was possible to preserve all of the Volkswagen Beetle's typical styling characteristics. This should come as no surprise; after all, it was vehicles like the Beetle, Microbus and original Golf that had a decisive influence on Volkswagen's "design DNA." Of course, some of the Beetle's longstanding characteristics remain: these include its round headlights (optional bi-xenon headlights with LED daytime running lights are available for the first time in this model series), the flared wings, the shapes of the bonnets, sides and door sills and - more than ever - the large wheels (up to 19 inch) that can be integrated. 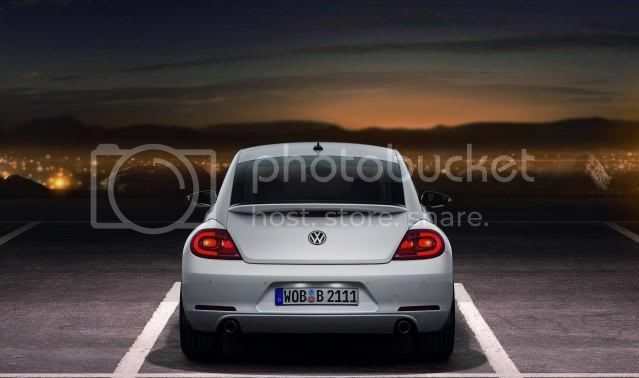 A new feature is the rear spoiler that is homogeneously integrated in the design (standard for TSI engines with 118 kW / 160 PS and 147 kW / 200 PS); it aggressively maintains contact with the road on this Volkswagen, which has a top speed of up to 225 km/h, depending on the engine, and is available in the three equipment lines "Beetle", "Design" and "Sport". Incidentally, the top surface of the rear spoiler is always black, while its underside is painted in body colour. These colours - 12 different hues - will make everyday car driving more vibrant with names such as "Saturnyellow" and "Denim Blue". The cockpit makes a visual impression. Is it possible for a cockpit to make an impression? Are you kidding? By its very nature! Car drivers sit in the cockpit. Sometimes for hours at a time. And yet, there are cars whose cockpits do not leave any lasting impression. They have a "look alike" appearance, as the marketing people say - one easily mistaken for another, lacking charisma. The VW Beetle's cockpit, on the other hand, is unique, unmistakable, cool, classic and designed with a passion for detail. This cockpit is perceived as something special. Everything within reach and sight. The shape and use of colour in the painted or carbon-look front facia panel of the dashboard hark back to the design of the first VW Beetle, yet the new car does not have a retro look. In Europe, for example, this facia is styled in "Schwarz uni" (Black) on the base model ("Beetle"); in the "Design" equipment line, it is always painted in the specific exterior colour. Customers choosing the "Sport" level get the carbon look ("Carbon Fibre"). Regardless of which colours are used, Volkswagen drivers will be able to locate every interior feature with their eyes closed. And yet everything has been redesigned. Three round instruments arranged in front of the driver (tachometer, speedometer, fuel gauge) provide all key information; integrated in the speedometer (middle position) is a multifunction display. From the "Design" equipment level, the adjustable air vents and the instruments have chrome bezels. This also applies to the audio/navigation systems optimally located in the driver's visual field on the dashboard, framed by two air vents. This also includes the controls for the climate control system. Everything is within grasp and sight. Comeback of the glovebox. Similar to the original Beetle, the new car has an extra glovebox integrated in the front facia whose lid folds upward (the standard glovebox that is also integrated opens downward). Another classic feature: the optional auxiliary instruments above the selected audio/navigation system: oil temperature, clock with stopwatch function and boost pressure gauge. Also new: the steering wheels specially designed for the Volkswagen Beetle with optional painted accents in the spokes depending on the equipment line. Details like these clearly indicate that the occupants are in a Beetle - there's no mistaking it. Air-cooled Beetle. New Beetle. The Beetle. A distinguishing feature of The Beetle - the third generation if you will - is that its interior ergonomics and packaging are based on completely new parameters. While drivers in the air-cooled Beetle travelled in a very low-slung seat, and drivers of the New Beetle felt as if they were chauffeured because the bonnet was so far forward, the latest Volkswagen Beetle now offers an agile, driver-oriented coupé experience. Every feature is within easy reach. In addition, Volkswagen has once again succeeded in implementing a quality of materials that goes beyond all class limits. The car's styling, ergonomics, operability and quality interact to create a new, friendly car with a highly individual nature. The New Beetle was a cathedral inside. 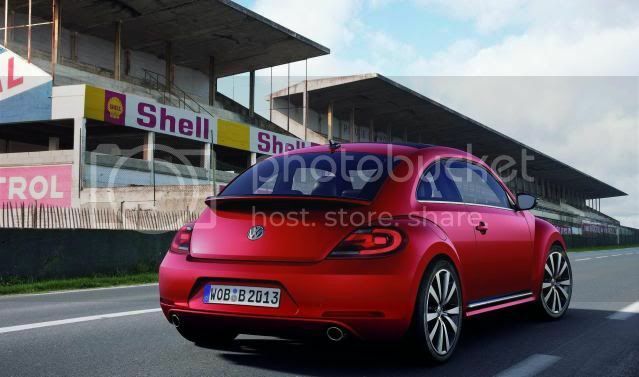 In front, the Beetle is now somewhat lower in profile, since the domed roof of its predecessor has been eliminated. It now offers 1,044 mm interior height instead of the previous 1,082 mm. However, the 38 mm will hardly be missed, even by very tall drivers, since the New Beetle's interior was a "cathedral" among compact cars. Meanwhile, in the rear seating area, the longer roof section results in a distinctly larger feeling of space. The bootspace is significantly larger; it now holds 310 instead of 209 litres. As usual, the car has a split, folding rear seatback, and a wide opening bootlid making it is easy to load and unload. Bi-xenon headlights and LED daytime running lights. 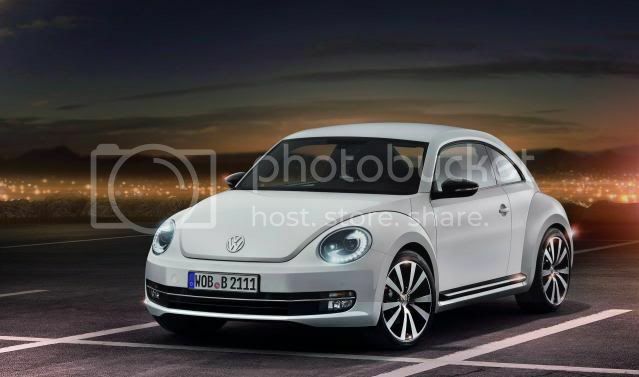 Volkswagen is offering the Beetle with bi-xenon headlights for the first time. 15 LEDs frame the xenon module on the outer perimeters of the headlights; they implement the daytime running lights and parking lights. Panoramic roof. It is transparent, and it can be tilted or opened. Therefore, the exact name is: panoramic tilt/slide glass sunroof. Much more important: It is 80 percent larger (glass surface area) than on the previous model. Incidentally, the insulating glass blocks 99 percent of UV radiation and 92 percent of heat energy. Radio-CD and radio-navigation systems. 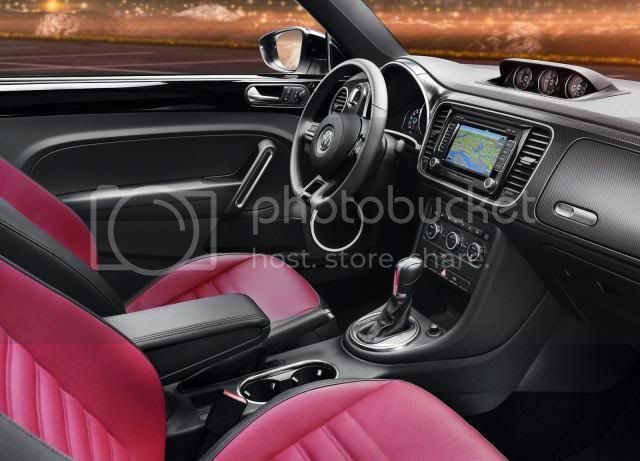 The New Beetle was exclusively available with radio-CD systems specially designed for this model. No navigation systems were offered. Now, Volkswagen is taking a completely different approach and is offering all of the systems available in other model series such as the Golf, Jetta or Passat on new VW Beetle as well. Standard in the Beetle is the RCD 310 with 8 loudspeakers, which is a very good audio system (includes dual tuner). The top audio system is the RCD 510 with integrated CD changer, interface for SD cards and touchscreen. An attractively priced entry-level radio-navigation system is the RNS 315 with 5-inch touchscreen (400 x 240 pixel), CD player, SD card slot and dual tuner. The top radio-navigation system model is the RNS 510. It offers refinements such as a 6.5-inch touchscreen, DVD player, voice control, SD card slot and 30 Gigabyte hard drive. Premium sound system by Fender. Anyone knowledgeable about the world of rock music is familiar with such greats as Jimi Hendrix and Eric Clapton. The first played Fender guitars, while the latter still does. Now, the legendary producer of US musical instruments and amplifiers - in a joint venture with Panasonic - is exclusively sharing its know-how with the Volkswagen brand. The result is an optional Fender sound system that is being offered in the Volkswagen Beetle with an additional woofer and 400 Watts of output power. Those choosing this sound system also get adjustable interior ambiance lighting. Besides providing indirect illumination, it also includes two light rings around the loudspeaker boxes in the doors. In Europe, the Volkswagen Beetle is the first car to offer a Fender sound system. Keyless Access. The Keyless Access locking and engine starting system is appearing for the first time in the Volkswagen Beetle; it operates without a door or ignition key. When one of the front door handles is touched, the system detects access authorisation from a transmitter carried in the person's jacket, trousers or hand bag; it then unlocks the Beetle and enables an engine start via the engine start button. Locking of the Volkswagen is from the outside, also activated by touching one of the two door handles; in this case, however, a specially marked surface is used. All round safety. Let's get to the point. In The Beetle, Volkswagen is building an automobile that is one of the safest in terms of both active and passive safety. Naturally, the ESP electronic stabilisation programme is standard, as is an effective network of six airbags that protects in the passenger compartment. Naturally, the car body - much of it laser-welded and galvanised - exhibits one of the best torsional rigidity values in the segment at 26,000 Nm/º. Naturally, because safety is a fundamental quality in a Volkswagen. US diesel with 140 PS. When it comes to engines, all signs point toward sustainability. 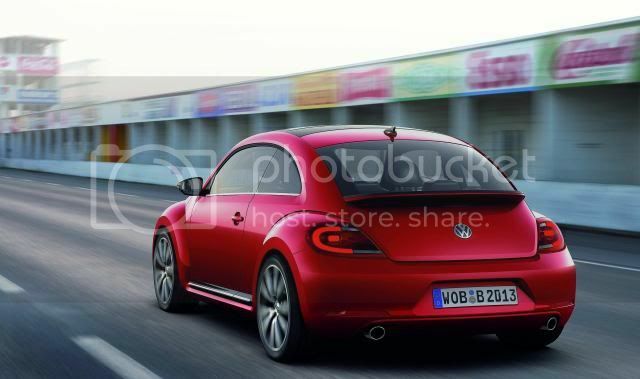 In the USA, the VW Beetle will be offered as a turbodiesel for the first time. The Beetle 2.0 TDI (103 kW / 140 PS) meets all USA emission limits and attains 40 mpg fuel economy in the Highway cycle, 29 mpg in City driving, and 33 mpg combined. As a result, the Volkswagen Beetle is a good choice as one of the most fuel-efficient cars in its class. Incidentally, the Volkswagen not only has excellent fuel economy values in the version with a 6-speed manual gearbox, but also - and this is a technical debut in the Beetle as well - with the optional 6-speed dual clutch transmission. US petrol engines with 170 PS and 200 PS. Fuel economy values were also improved in the 2.5-litre five cylinder petrol engine, which was already a success in the previous model. The manually shifted VW Beetle attains 22 mpg (City), 31 mpg (Highway) and 25 mpg (combined). Its counterpart with a 6-speed automatic comes in at 22 mpg (City), 29 mpg (Highway) and 25 mpg (combined) - this represents an increase of up to 10 percent in fuel economy. Pioneering: even the Beetle 2.0 TSI with 147 kW / 200 PS of power attains a combined fuel economy of 25 mpg. The large TSI is also available with an optional 6-speed DSG. World engines with 105 PS, 140 PS, 160 PS and 200 PS. In markets such as Asia, Australia, Europe and New Zealand, the new Volkswagen Beetle will be offered exclusively with charged engines. All engine versions - all of them with four cylinders - are being used for the first time in this model series. The car exhibits significantly reduced fuel consumption and emission values compared to the previous model thanks to the switch to turbo-petrol (TSI) and common rail turbodiesel direct injection engines (TDI). The three charged petrol engines of the Beetle output 77 kW / 105 PS, 118 kW / 160 PS and 147 kW / 200 PS. The two diesel engines develop 77 kW / 105 PS and 103 kW / 140 PS (TDI engines are not offered in China). All five engines may be combined with a dual clutch transmission as an option. Engines with 160 PS and 200 PS in detail. Even the fast moving 225 km/h VW Beetle 2.0 TSI with 200 PS of power consumes just 7.4 l/100 km (equivalent to 173 g/km CO2) with a manual transmission. Also extremely economical is the 1.4 TSI with 160 PS shifted by a 7-speed DSG; in the Beetle it consumes just 5.9 l/100 km (139 g/km CO2). Fuel economy data like this makes the Beetle 1.4 TSI DSG (top speed: 207 km/h) a pleasant surprise in the engine programme. By comparison, the previous model with 110 kW / 150 PS attained a value of 8.9 l/100 km in the automatic version. Despite 10 PS more power, fuel consumption was reduced by 3.0 l/100 km or 34 percent. Differential lock for top petrol engine. To ensure that the power of the two strongest Volkswagen Beetle versions is applied properly to the road in quickly approached curves as well, the models with 160 PS (European version) and 200 PS (worldwide) come with a factory-installed XDS electronic differential lock. This system extends the familiar EDS functionality. XDS improves handling in fast curve driving and calibrates the car toward more "neutral" steering; it does this by using active brake intervention to prevent wheelspin of the unloaded wheel on the inside of the curve, and this improves traction. Engines with 105 PS and 140 PS in detail. The most fuel-efficient petrol engined model is the Beetle 1.2 TSI with BlueMotion Technology (including Stop/Start system and battery regeneration) and 105 PS with a top speed of 180 km/h. It has a combined fuel consumption of 5.5 l/100 km (129 g/km CO2). The comparable previous model (75 kW / 102 PS) consumed 7.5 l/100 km. Savings: 2.0 l/100 km or 27 percent. An extremely sustainable performer is the Beetle 1.6 TDI with 105 PS. At 4.3 l/100 km (equivalent to 112 g/km CO2), this diesel version is the most fuel-efficient VW Beetle ever built with BlueMotion Technology. Its fuel consumption is 20 percent lower than even the existing TDI engines which have always been very fuel efficient. Incidentally, on the Autobahn, the new Beetle 1.6 TDI with BlueMotion Technology can reach a top speed of 180 km/h - in this case, fuel economy is not gained at the cost of performance. This is especially true of the even higher performance TDI with 2.0 litre displacement and 103 kW / 140 PS. This torque-strong turbodiesel (320 Nm from 1,750 rpm) takes the Volkswagen Beetle to a top speed of 198 km/h and combined fuel consumption of just 4.9 l/100 km (equivalent to 129 g/km CO2). This means that the Beetle for a new era will once again show how it can "go, and go and go ..."